As we have learned more about oral health, we have a better understanding of the importance of oral hygiene that includes routine professional cleanings and evaluation. Gum disease is a silent, progressive condition that millions of people unknowingly have. In fact, gum disease is the greatest cause of tooth loss in adults. 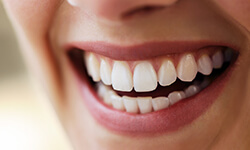 Gum disease treatment and prevention can help save your teeth and oral health. Although certain factors seem to have a direct impact on oral health, an imbalance in oral bacteria instigates inflammation and infection of gum tissue. The mouth is host to millions of bacteria, some good, and some bad. Shifts in hormones, poor oral hygiene, and other factors may throw off this balance and give harmful bacteria optimal conditions to thrive and damage teeth and gums. As bacteria produce waste, plaque may form and adhere to teeth. Bacteria live in this plaque, resulting in red, swollen gums, bad breath, or a bad taste in the mouth. Discovering and treating gum disease in its earliest form, which is gingivitis, is extremely beneficial. This is the only time when the condition can be reversed. In this stage of gum disease, infection has affected gum tissue only. Teeth are still held firm within their sockets and bone has not been damaged. Untreated gingivitis progresses to periodontitis, in which gum tissue begins to pull away from the teeth due to the presence of plaque beneath the gum line. This pulling away allows pockets to develop, in which debris collects. At this point, gum disease is no longer curable, but can be managed with adequate, ongoing care and excellent at-home oral hygiene. Allowing gum disease to go untreated results in an immune response to fight the infection below the gum line. As the body fights the infection of periodontitis, toxic substances from bacteria break down the connective tissue and bone that keep teeth in place. Those with more advanced stages of gum disease may notice that teeth feel loose or begin to shift, affecting the bite. 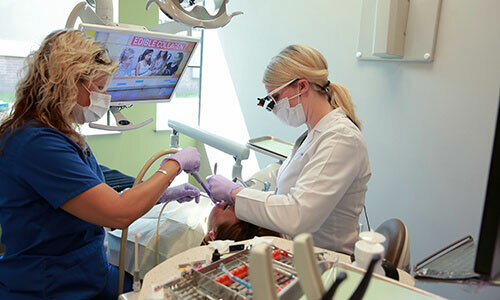 Dr. Angie takes a proactive approach to gum disease treatment and prevention, thoroughly assessing patients' gum tissue during routine examinations. It is better to prevent gum disease than to fight it once it has developed. Contact us to schedule your examination with Dr. Angie. If you've already begun losing teeth as a result of gum disease, Dr. Nauman can replace them using dental implants. The idea of gum disease, for many, is far off. This is ironic, considering that fifty percent of adults in America have some form of this potentially serious condition. Gum disease occurs in stages, and is largely controllable with adequate oral hygiene. However, because this disease process has such subtle beginnings, many people leave gum disease untreated until problems become obvious. At Glisten Dental, Dr. Nauman and our skilled hygiene team are careful to check for gum disease during routine examinations. Our mouths contain more than teeth, our tongue, and gums. Every person has bacteria that naturally occur. Bacteria are living organisms that are nourished by sugary substances, of which tiny particles may be left behind after meals. In addition to feeding on sugars, bacteria also combine with these substances, along with saliva, and they become stuck to tooth surfaces in what we call plaque. As plaque collects around the gum line, gingivitis develops. This condition tends to affect gum tissue only, causing inflammation. The signs, including redness or minimal bleeding during brushing, are so easily explained away that many people fail to get the treatment early on. Untreated gingivitis progresses to periodontitis, a condition affecting deeper parts of the gums, and threatening bone tissue. Once periodontitis has set in, pockets begin to form around affected teeth, giving bacteria more places in which to settle. Early recognition of gum disease, before pockets form and tissue has begun to deteriorate, is vitally important to the elimination of gum disease. This condition, as it progresses, poses a threat to the entire body. The goal of gum disease treatment is to get infection under control. We know that we cannot fully eliminate bacteria, as these microorganisms are naturally occurring in the body. In treating gum disease, we reduce bacterial activity, and restore gum tissue to a healthier, more resistant state. Gum disease is a condition treated based on severity. Ideally, regular dental visits are maintained. This allows us to combat gum disease through preventative measures, avoiding invasive treatments. When early signs of gum disease are detected, your dentist and hygienist can discuss hygiene measures to reverse the effects of harmful bacteria. Often, professional cleanings at this stage will remove mild plaque and tartar, restoring optimal oral health. As gum disease progresses below the gum line, the pockets must be addressed to remove bacteria and restore optimal connection between gum tissue and teeth. Scaling is the process by which plaque and tartar below the gum line is removed. Our hygienist provides gentle care, and can perform treatment after the gums have been numbed, similar to other dental treatments. Following the removal of harmful substances, the roots of affected teeth are smoothed in the root planing process. When treating gum disease we take a personalized approach to care by recommending lifestyle changes and specific forms of treatment aimed at getting you back to your healthiest, most attractive smile. Contact Glisten Dental for exceptional dental care. The Centers for Disease Control and Prevention (CDC), reports that about half of all Americans have some form of periodontal disease. This chronic inflammatory condition deteriorates gum tissue and the bones and ligaments that support teeth. Without treatment, gum disease leads to bad breath, discolored gums, tooth loss, and loss of facial structure. It is also associated with grave systemic disorders such as cardiovascular disease, diabetes, and Alzheimer’s disease. The good news is that residents of the Tulsa OK area can enjoy beautiful, healthy smiles with a simple gum disease prevention program. Dr. Angie Nauman and the Glisten Dental team explain how. You play the biggest role in preventing gum disease, so the next step is showing you what to do after you leave our office. We’ll demonstrate the correct way to brush (after meals or at least twice a day), and floss before bedtime. A 60-second twice-daily rinse with antiseptic mouthwash helps to reduce oral bacteria that cause gum disease. Remember, if you can’t brush right after eating, swish with plain water to flush out larger food particles and reduce acids. Chewing sugar-free gum with Zylitol helps too. Maintain regular hygiene visits twice a year or more often if Dr. Nauman recommends it. Our hygiene team can see and reach spots you can’t get to at home, and the visits give Dr. Nauman a chance to monitor your oral health. We know you are busy and these appointments are easy to forget, so we assist with convenient scheduling and reminders. Tobacco use, diet, and stress contribute to gum disease. We’ll talk with you about safe cessation programs, healthy food choices, and stress reduction techniques to help you enjoy a naturally strong mouth and body. Other factors beyond your control, such as pregnancy or diabetes, may increase your risk of periodontitis. In those cases, or if you already have gum disease, it is especially important to get it under control and manage it with regular professional care. We provide effective, compassionate treatment options. We love introducing new patients to a lifetime of fresh smiles. We begin by understanding your overall medical situation, since some health conditions and medications make you more susceptible to gum disease. You receive a thorough oral examination including a soft tissue evaluation, and a professional cleaning. Don’t be afraid to call us, even if you’ve let your oral care slip for a while. We’ll get you back on track. There's no need to put your smile or your health at risk from gum disease. Dr. Nauman and the Glisten team are here to help. Call today to become our newest patient. The number is (918) 254-8686.